LAST night’s Globe Derby win has provided prominent horsewoman Claire Goble with extra racing options with Clarenden Hustler. 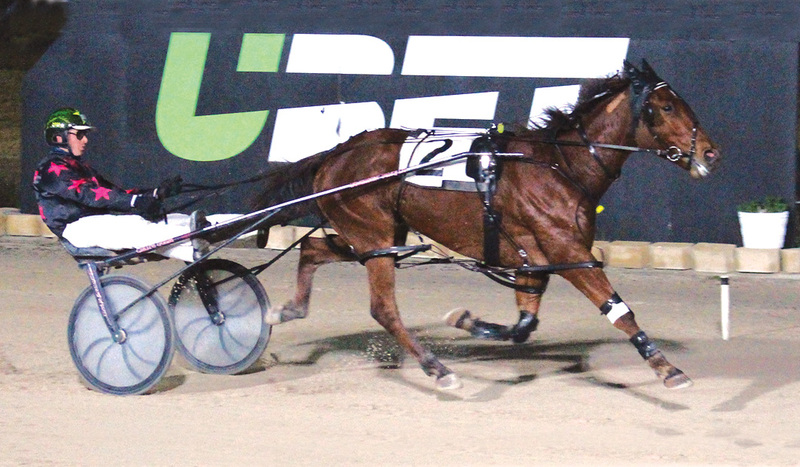 Driven by Ken Rogers, the handy son of Blissfull Hall blitzed his rivals during his standing start debut. Thrilled with the four-year-old’s performance, Goble stated the ability to compete in handicaps will ease the task of selected suitable races. “That was his first go at a stand and he did well,” Goble said. “I qualified him quite a while ago, but didn’t race at the time for some reason. Beginning quickly from three, Clarenden Hustler enjoyed the run of the race behind Star Of Dionysis, which led from the pole. Angled away from the pegs leaving the back straight, the gelding sprinted to an effortless 17-and-a-half metre win from Floyd Mayweather, with Star Of Dionysis six metres away third. Bred and owned by Goble, Clarenden Hustler rated 2:00.1 over 2230 metres, taking his record to 13 wins and 15 placings from 38 starts. “He got a dream run, but still had to make the most of it,” Goble said. “The manner in which he sprinted away from them once in the clear was impressive and he won with plenty up his sleeve.